Nicole Chastain Price comes to the Western Dressage ring after years of what seems like a destined path. Starting as a western rider, to eventing, h/j, to becoming a “white pants” Dressage trainer, USDF Certified Instructor, USDF Bronze, Silver and Gold Medalist and USDF “L” Graduate, she is, in addition to traditional Dressage, enjoying Western Dressage. She is also a cow horse enthusiast she has been riding sorting and ranch horses for the last 12 years and feels Western Dressage is the perfect way to physically and mentally build horses with the best foundation for a successful future. 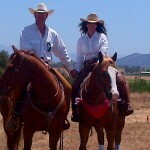 She and her husband, Brad Price, take horses in training, teach lessons, clinic and judge. Nicole can be reached at nicole@nicolechastain.com.